It’s been a crazy few months for me. With moving to a new apartment, starting a new business (Preggie Baby Boutique – check it out! ), and my best friend moving to another state – across the country, it’s been hectic. I haven’t had much time for cooking. I’ve mostly eaten out or picked up ready-made food at our local grocery store. Tonight was a different story, however. I was itching to cook. 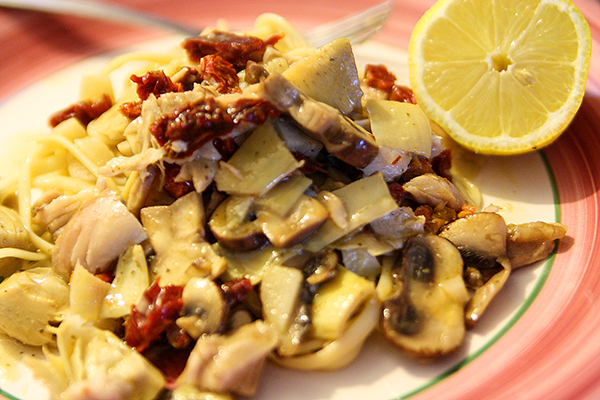 Since I wasn’t in the mood to go to the grocery store, I used what I had in my fridge – left over rotisserie chicken, a jar of artichoke hearts, fresh mushrooms, a small package of sun-dried tomatoes, and of course – linguini pasta. There’s not much you can do with leftover rotisserie chicken (except to eat it, of course), but I wanted to do something else, something different. Essentially, I used the sauce from chicken piccata (chicken stock and a squirt of lemon) as the base for this yummy pasta. This is an individual size serving, since I am a family of one human (and two pets). 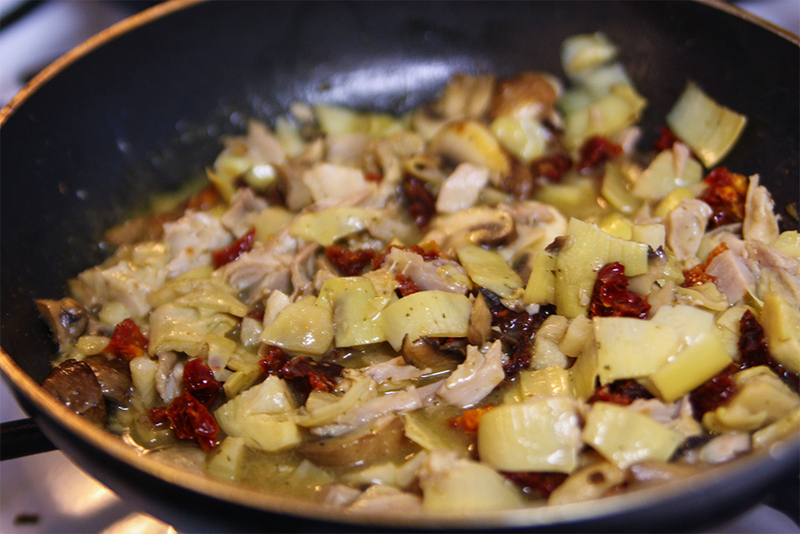 I only cooked enough for two meals – one which I ate tonight, and the second portion I will eat tomorrow at work. If you want to make more servings, double the recipe.